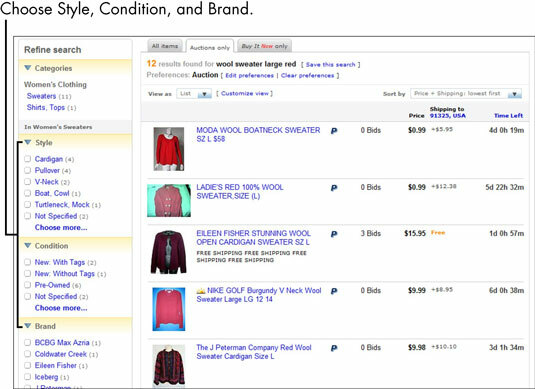 You can refine your eBay search by narrowing it down to a category. When you click a category listed under Refine Search, you’ll get closer to what you’re looking for. For example, if you’re searching for a wool sweater large red, you can click the Women’s Clothing Category to open up a much easier way to find your item. By choosing a category, you get appropriate options for narrowing your search. Depending on what you’re looking for, eBay’s category refinements can make your search run a good deal smoother. Narrowing your eBay search in a category is an effective approach with many types of searches. This same idea works in any category. Suppose that you have a hankering to watch the old classic BBC television program, Absolutely Fabulous. And you want it on DVD. 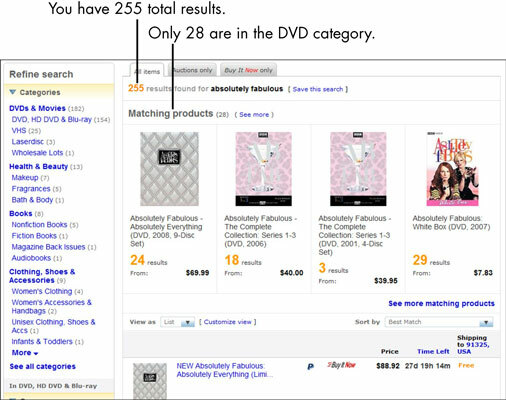 Simply search for the keywords Absolutely Fabulous and then select the category of DVD to pare down the many results. If you put into practice several search techniques, you’d type “Absolutely Fabulous” DVD into the Search box. What you type includes the identifying keywords for your item, quotation marks to get the exact phrase, and the additional keyword DVD to identify the media format. You go directly to the DVD version of the TV program without traversing all those link-clicking steps.